This picture of the bride and groom was taken at the very end of the night. 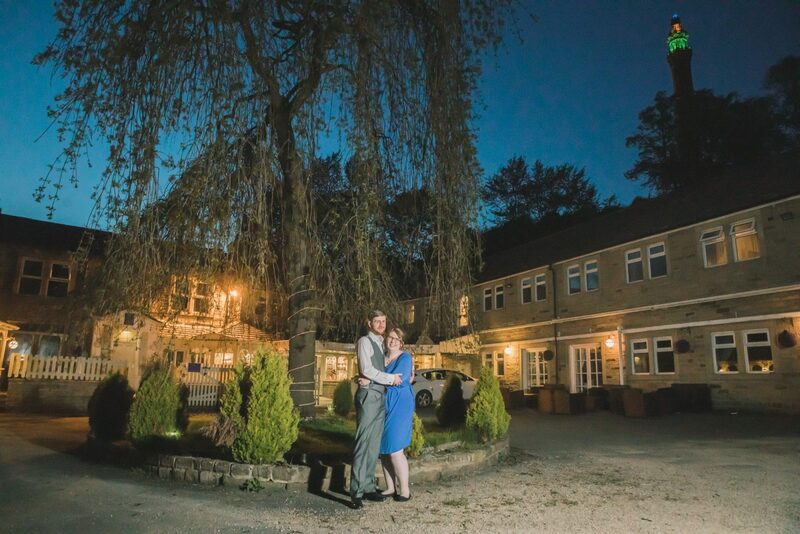 Adam and Louise had asked for one more photograph that showed the venue all lit up. I grabbed a light stand and umbrella from my car, and we tried a couple of quick pictures with the flash set up to the right. Louise had changed out of her lovely wedding dress for the evening, so she could relax and get more dancing done. The tower in the right of the shot is a folly that’s open on bank holidays, and the source of the venue’s name. I like the blue gradient of the sky in the background. It gives a hint of the beautiful sunshine earlier on in the day.